Normal operating hours for the Sheriff’s Office ACOs will be from 8 a.m. to 8 p.m., seven days a week. Officers will be on call from 8 p.m. until 8 a.m. for any emergencies that may arise. Citizens may call the non-emergency number (352-726-1121) to report animal complaints, or simply dial 911 to ask for assistance during an emergency. The Animal Control Unit consists of 6 full time officers as well as a working supervisor. Officers respond to calls for service between the hours of 8:00 am & 8:00 pm seven days a week. ALL OF THE ABOVE CALL TYPES PERTAIN TO DOMESTIC ANIMALS AND LIVESTOCK ONLY. NUISANCE WILDLIFE MUST BE REFERRED TO A NUISANCE TRAPPER. Dogs may not be tied unless a person is present and can see the tethered animal at all times. Tethers must be on a minimum of 20’ tether w/ shelter & water at all times a, per County Ordinance. Dogs may not be tethered using a choke chain or prong/training collar. Animal Control Officers (ACO’s) are available to respond to routine calls for service between 8:00 am & 8:00 pm seven days/week including holidays. Emergencies are responded to 24 /7. If you exceed the time limit specified without presenting proof of compliance to the Citrus County Animal Shelter, the warning citation will automatically turn into a citation & fine. You will then have two options. Contest the fine by appearing in county court. The court will notify you of the date and time. Should you be found guilty, additional court costs will be assessed. If a mandatory court appearance is listed on the citation you are required to go to county court on the date the Clerk of the Court’s office notifies you. If you fail to do one of the above options, a judgment may be placed against you, your driver’s license may be suspended or warrant may be issued for your arrest. Refusal to sign a citation is a misdemeanor in the second degree per F.S. 775.082 and may be charged with a fine of $500.00 and/or 60 days in jail. Signing a citation is NOT an admission of guilt and you have the option to contest the citation as outlined above. Have your pet vaccinated by a licensed veterinarian. Rabies vaccinations are required by state law and county ordinance. Other vaccinations are recommended for the health of your pet. Purchase your Citrus County Animal License annually or as required by county ordinance and have your pet wear the license tag so you can be notified if the pet is lost. Animal Services can microchip your pet for permanent lifetime identification ($15.00). Pets must have access to wholesome food, clean water, proper shelter and veterinary care by state law and county ordinance. Do not allow your pet to become a nuisance to your neighbors. Dogs may not be tied unless a person is present and can see the tethered animal at all times. Tethers must be on a minimum of 20’ tether w/ shelter & water at all times a, per County Ordinance. 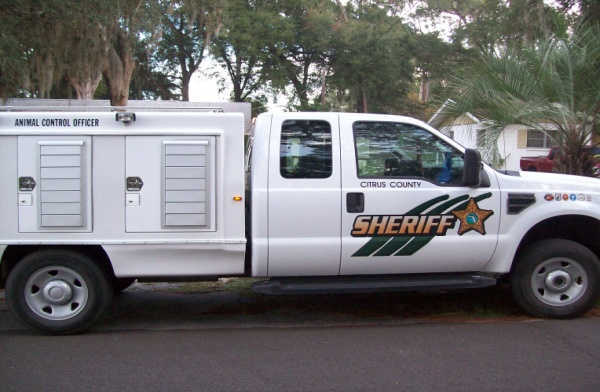 Stray animals impounded at the Citrus County Animal Shelter are held for three (3) days to allow owners to locate and claim them. At the end of that time, the animal becomes the property of Citrus County Animal Services.